Contexts: Association of lipid markers and occurrence of impaired fasting glucose (IFG) have a different pattern in different populations. Aims: The present study aimed to investigate the associations of some lipid markers with impaired fasting glucose in Kermanshah city, 2013. Settings and Designs: By a case-control study, 120 IFG subjects and 240 controls were recruited. Materials and Methods: Each subject was interviewed using a sociodemographic questionnaire and lipid markers including total cholesterol (TC), triglyceride (TG), low-density lipoprotein cholesterol (LDL-c), high-density lipoprotein cholesterol (HDL-c), and fasting plasma glucose (FPG) were checked. Statistical Analysis Used: Chi-square test (χ 2 ), independent samples t-test, Pearson correlation coefficient, and a multiple logistic regression were used for statistical analyses. Results: IFG subjects had significantly higher TC, TG, and LDL-c than controls (P < 0.05) but both groups had comparable body mass index (BMI) and HDL-c, (P > 0.05). FPG was positively and significantly correlated with TG and TC ranges but not with BMI, LDL-c, and HDL-c. The highest correlation coefficients (r) with FPG was for TG rather than TC (r = 0.14, P < 0.01). In multivariable regression, the odds ratios (ORs) estimated for lipid markers were not associated with IFG but ORs in those females reported to have a history of oral contraceptive pill (OCP) usage was 2.4-fold compared to the controls [OR = 2.4, confidence interval (CI): 1.16-4.95]. Conclusions: TC, LDL-c, and TG had significantly higher values in IFG subjects and should be taken into consideration for the prevention of IFG. Since only a limited number of studies have investigated the association of IFG and obesity and lipid markers in the Iranian population, it is essential to know this association in our population. In addition, since IFG is the early phase of diabetes and cardiovascular diseases, identifying preventable risk factors associated with IFG at this stage is necessary for the prevention and management of these diseases. Therefore, the present study aimed to investigate the associations of some lipid markers with IFG. This case-control study was conducted in Kermanshah city in the west of Iran with a total population of 851,405 in 2011. A total of 360 subjects (120 cases and 240 controls) aged 20 years, refereed to two governmental and central laboratories of Kermanshah city were interviewed. For the purpose of this study, we used convenient sampling. All the subjects were recruited for more than 2 months (January 28, 2013 until April 20, 2013). Cases of IFG were selected from all subjects whose fasting plasma glucose (FPG) was between 100 mg/dL and 125 mg/dL after fasting for more than 8 h and those who did not have previous history of hyperglycemia; therefore, they were incident cases. Two healthy controls who had FPG < 100 mg/dL were considered for each case. Our inclusion criteria for cases were: Age ≥20 years old and having FPG between 100 mg/dL and 125 mg/dL. Those who had FPG >125 mg/dL, history of heart disease, myocardial infarction or heart failure,  migraine,  and previous history of hyperglycemia (type 1, 2, and gestational diabetes) were excluded. Blood samples, including FPG, serum cholesterol [total cholesterol (TC), LDL-c, and HDL-c], and TG concentrations, were measured by commercially accessible enzymatic reagents (Pars Azmon, Iran) using the Selectra auto analyzer (Pars Azmon, Iran). The protocol was approved by Kermanshah University of Medical Sciences Ethics Committee. Each subject gave informed oral consent before participating in the study. All participants were interviewed using a questionnaire to obtain information on demographic data including age, gender, job, marital status, residential area, hypertension history, family history of diabetes in first-degree relatives (parents, siblings, and children), history of oral contraceptive pill (OCP) usage, and information about whether the participant had birth weight of more than 4 kg. Height and weight were measured to calculate the body mass index (BMI) (kg/m 2 ) as an indicator of obesity. Data analysis was performed using SPSS statistical software version 16 for Windows (SPSS Inc., Chicago). Chi-square test (χ2 ), independent samples t-test, Pearson correlation coefficient, and a multiple logistic regression analysis were performed and the last was used to control confounding. For the purpose of multiple logistic regressions, we excluded LDL as it has colinearity with TC. In addition, odds ratio (OR) with 95% confidence interval (CI) was estimated for comparing IFG cases and normal individuals. The presented P values are two-sided and considered significant when <0.05. The total number of subjects included in this analysis was 360, of whom 120 were cases of IFG and 240 were controls. Out of the total, 185 subjects (51.4%) were female and 175 subjects (48.6%) were male. Their ages ranged from 20 years to 83 years with a mean and standard deviation (SD) of 50.98 ± 12.37 years for IFG cases and 44.4 ± 13.97 years for controls, respectively, (P < 0.0001). There were no statistically significant differences in gender, job, marital status, residential area, and family history of diabetes between IFG subjects and controls [Table 1]. Nevertheless, the risk of IFG for those females reported to have a history of OCP usage was 2.52-fold (OR = 2. 52, 95% CI: 1.32-4.82) and for those who had a history of more than 4 kg birth weight was 2.45-fold (OR = 2. 45, 95% CI: 1.12-5.37), compared to the control group. In addition, a patient with history of hypertension was more likely to develop IFG (OR = 1.53, 95% CI: 0.93-2.51) [Table 1]. IFG subjects had significantly higher TC (P = 0.002), TG (P = 0.018), and LDL-c (P = 0.018) than the controls but the distribution of BMI (P = 0.11) and HDL-c (P = 0.98) was almost the same in the two groups, [Table 2]. FPG was positively and significantly correlated with TG and TC and although it was positively correlated with BMI, LDL-c, and HDL-c, its correlation was not statistically significant. The highest correlation coefficients (r) was related to TG so that for the four lipid markers, TG was more correlated with FPG (r = 0.14, P < 0.01), [Table 3]. After adjusting for desired variables, overall, those with history of OCP usage had a higher risk of IFG (OR = 2. 4, CI: 1.16-4.95) but the ORs estimated for lipid markers had almost no remarkable effect on IFG [Table 4]. The present study results also suggest that TG can be more strongly correlated with IFG than TC. In a similar result, Qian et al. found that increased fasting TGs were more correlated with TC. Moreover, Love-Osborne and colleagues reported that increased fasting TGs could predict the risk of hyperglycemia. Therefore, TG as a lipid marker can be considered as one of the most important predictors of IFG. 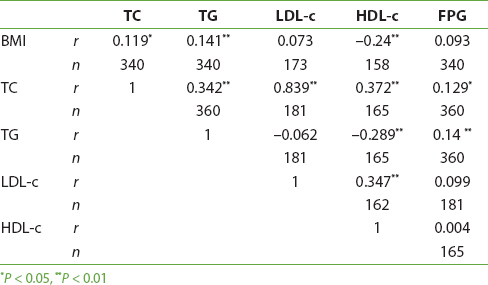 The values of TC, TG, and LDL-c in IFG subjects were significantly more than in the controls but the distribution of BMI and HDL-c was almost the same in the two groups. FPG was positively and significantly correlated with TG and TC but not significantly with LDL-c, HDL-c, and BMI. After adjusting for desired variables, overall the ORs estimated for lipid markers had almost no remarkable effect on IFG. The significant and high value factors should be taken into consideration simultaneously for prevention of IFG. We are grateful to the subjects for participating in this study. The medical outpatient clinic staff of Kermanshah and the laboratory staff of Markazi (reference) and Mahdiyeh are deeply appreciated for their assistance regarding data collection and laboratory investigations, respectively. Qian Y, Lin Y, Zhang T, Bai J, Chen F, Zhang Y, et al. The characteristics of impaired fasting glucose associated with obesity and dyslipidaemia in a Chinese population. BMC Public Health 2010;10:139. Noale M, Maggi S, Zanoni S, Limongi F, Zambon S, Crepaldi G. Lipid risk factors among elderly with normal fasting glucose, impaired fasting glucose and type 2 diabetes mellitus. The Italian longitudinal study on aging. Nutr Metab Cardiovasc Dis 2013;23:220-6. Love-Osborne K, Butler N, Gao D, Zeitler P. Elevated fasting triglycerides predict impaired glucose tolerance in adolescents at risk for type 2 diabetes. Pediatr Diabetes 2006;7:205-10. Bozorgmanesh M, Hadaegh F, Azizi F. Predictive performances of lipid accumulation product vs. adiposity measures for cardiovascular diseases and all-cause mortality, 8. 6-year follow-up: Tehran lipid and glucose study. Lipids Health Dis 2010;9:100. Kermanshah, From Wikipedia, the free encyclopedia. Available from: http://www.en.wikipedia.org/wiki/Kermanshah. [Last accessed on 2013 Sep 26]. American Diabetes Association. Standard of medical care in diabetes. Diabetes Care 2004;27(Suppl 1):S15-35. Nanda N, Sen SK, Arokiaraj MC, Sripradha R, Roma R, Pattegar K. Myocardial infarction in nondiabetic and prediabetic population: A retrospective analysis. Indian J Physiol Pharmacol 2009;53:334-40. Cavestro C, Rosatello A, Micca G, Ravotto M, Marino MP, Asteggiano G, et al. Insulin metabolism is altered in migraineurs: A new pathogenic mechanism for migraine? Headache 2007;47:1436-42. Avramoglu RK, Basciano H, Adeli K. Lipid and lipoprotein dysregulation in insulin resistant states. Clin Chim Acta 2006;368:1-19. Daboul MW. A study measuring the effect of high serum triglyceride and cholesterol on glucose elevation in human serum. Oman Med J 2011;26:109-13. Liu J, Joshi D, Sempos CT. Non-high-density-lipoprotein cholesterol and cardiovascular risk factors among adolescents with and without impaired fasting glucose. Appl Physiol Nutr Metab 2009;34:136-42. Drexel H, Aczel S, Marte T, Benzer W, Langer P, Moll W, et al. Is atherosclerosis in diabetes and impaired fasting glucose driven by elevated LDL cholesterol or by decreased HDL cholesterol? Diabetes Care 2005;28:101-7. American Diabetes Association. Standards of medical care for patients with diabetes mellitus. Diabetes Care 2003;26(Suppl 1):S33-50. Chakarova N, Tankova T, Atanassova I, Dakovska L. Serum lipid and hsCRP levels in prediabetes--impaired fasting glucose (IFG) and impaired glucose tolerance (IGT). Diabetes Res Clin Pract 2009;86:56-60. Taniguchi A, Nagasaka S, Fukushima M, Nakai Y, Nishimura F, Okumura T, et al. Role of triglyceride, adiponectin, and body mass index in identifying insulin resistance in Japanese isolated impaired glucose tolerance male subjects. Official Journal of Japan Society of Ningen Dock 2011;25:31-6. Sayeed MA, Mahtab H, Akter Khanam P, Abdul Latif Z, Keramat Ali SM, Banu A, et al. Diabetes and impaired fasting glycemia in a rural population of Bangladesh. Diabetes Care 2003;26:1034-9. Thompson JL, Herman CJ, Allen P, Helitzer DL, Wilson ND, Whyte AN, et al. Associations between body mass index, cardiorespiratory fitness, metabolic syndrome, and impaired fasting glucose in young, urban native American women. Metab Syndr Relat Disord 2007;5:45-54. Lee DC, Sui X, Church TC, Lee IM, Blair SN. Associations of cardiorespiratory fitness and obesity with risks of impaired fasting glucose and type 2 diabetes in men. Diabetes Care 2009;32:257-62. Sainaghi PP, Castello L, Bergamasco L, Carnevale Schianca GP, Bartoli E. Metabolic characteristics of glucose intolerance: The critical role of obesity. Exp Clin Endocrinol Diabetes 2008;116:86-93. Hagman E, Reinehr T, Kowalski J, Ekbom A, Marcus C, Holl RW. Impaired fasting glucose prevalence in two nationwide cohorts of obese children and adolescents. Int J Obes (Lond) 2014;38:40-5.